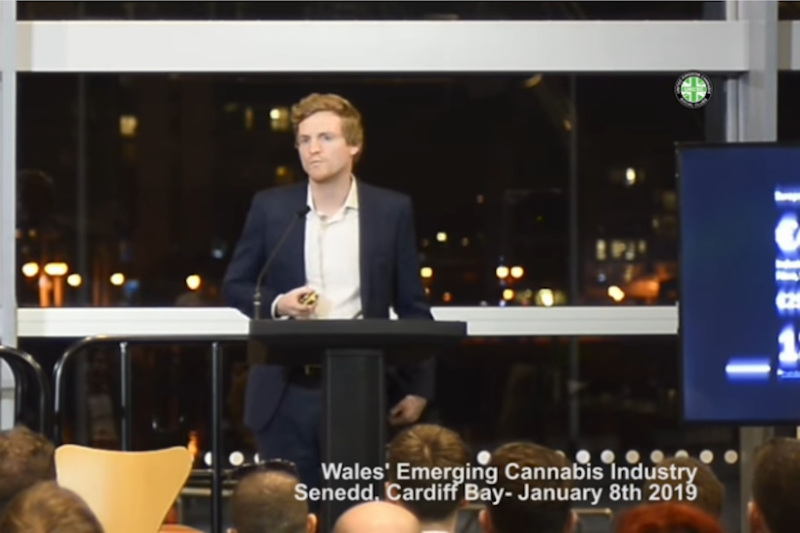 Nathaniel Loxley, founder of Vitality Hemp and co-founder of the British Hemp Association, provided a unique insight into the struggle to become established as a small UK hemp farmer at the Cannabis Industry Wales summit on 8 January. Nathaniel moved from a relatively secure career in Financial Crime Risk within the banking sector. After researching hemp five years ago and developing a passion for realising the benefits and opportunities involved, he said he decided it was time to “take the bull by the horns” and move into hemp farming. He described the “bureaucratic nightmare” of getting a licence from the Home Office, which he secured in 2014. “To go through the process you have to buy certain cultivars, there are restrictions on where you’re growing, what you’re growing, and what your end products are. It has become even more strict since. “I was given an opportunity to grow in Sussex, which is really fantastic. I looked to Aldo Leopold and his book A Sand County Almanac (1949), which is a real inspiration for getting involved with regenerative agriculture. “We can use every single part of the plant. It has had a cultural and social impact that has been really significant for millenia, but for the past 80 years we’ve been divorced from that. Now it’s time to re-engage with it. “I started growing different varieties of the plant for different reasons. We want to make as much use of as much of the plant as possible. The restrictions mean you have to grow below 0.2% THC varieties, which is very challenging and limits opportunities. “We’re also limited in the UK by lack of infrastructure. We can’t process enough of it to realise its potential at the moment. So that’s why we are looking to connect with different businesses, to build something a bit more substantial. There are different silos dotted around the country in England, in Scotland, in Wales, but they’re struggling. Nathaniel said that although Britain is “very far behind” the global industry, there were several inspiring roadmaps to follow. “Countries like Canada, Greece and Italy have much more developed industries. In Canada it has been legal to grow industrial hemp and with government incentives and subsidies put into the research behind it. In 2018 Greece took the opportunity to start producing industrial hemp and medical cannabis. “A recent report by the Prohibition Partners estimate the market value at €45.2m. That’s industrial hemp alone. This is just seed and stalk. In the UK alone, by 2020 the potential is huge. The figure they have is £25m; I tend to believe it could be a lot more, because of consumer-driven demand. With the European Industrial Hemp Association lobbying for hemp incentives for farmers, Nathaniel said Brexit has caused plenty of uncertainty. “Regional incentives are a real driver and that is something that we should impart to our own initiatives, to empower farmers to grow hemp. “The NFU (National Farmers Union) says that 70% of farms’ income is from [government] subsidies. Another example is for forestry. You get £2,000 per hectare but it has to be commercial, so you have to cut it all down. From an environmental perspective it’s absolutely ludicrous. “We need to reconnect with our land and actually look at our agri-food supply chain. We have some fantastic innovators and schemes, like the innovate UK scheme; I’m involved in the Food Waste Network, a really good group of diverse businesses and academics, who have come together to reduce food waste from the point of production, all the way to consumption; it’s a really important aspect of CO2 emissions, let alone waste. That’s a really progressive group and there are partners in Wales, for example Bangor University and the University of South Wales. “There is a feeling of optimism at the moment, especially in the Innovate UK project, which offer commercially-driven incentives for cross-sector innovation. That’s really going to drive some change. We need to look at the technology we can use and integrate into conventional farming and how hemp can add value to that supply chain. “Obviously we have a consumer zeitgeist. The Blue Planet Effect is very much in the public consciousness. “The European Institute for Technology, the food aspect has just been set up for that so that’s a really interesting angle. But we really need to figure out how we’re going to do this with regards to Brexit. “Taking more responsibility with devolution and the opportunities that hemp can offer to a variety of problems is really quite significant. We can replace many conventional solutions that petro-chemical aggregates provide, and hemp is really set to disrupt a lot of industries. Monoculture has really depleted our soils and depleted our waterways and caused so much pollution. We need to develop our own regulatory framework and there are many challenges.